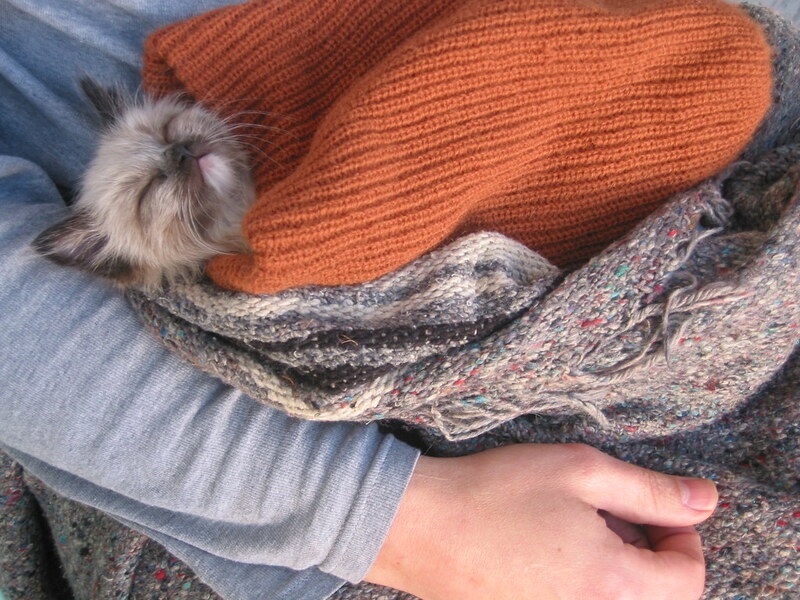 Here's little baby Baby Butterbean all tucked into a stocking cap/ sleeping bag, asleep in Craig's arms. She's was just six weeks old when this photo was taken. I can't even believe that is the same cat. She was and is very beautiful and precious. Don't you just wish they would never grow up and grow old? We have a new little baby, now 5 months old. I so wish she would stay a baby for us. She is such a joy! But them we love them all. We have a 15 year old as well. While we await a new litter of little ones, can you give us an update on the oh-so-fluffy Francine and Selma Darling? Awwwwww she's beautiful there, and she grew up to be gorgeous too of course! What a little slice of heaven...a warm lap to nap in, and a bitty kitty to snuggle!! Oh my - beautiful right from the start! So adorable! OMG! She's so cute, I think my head is about to explode! This photo melts my heart. Charlene, you can achieve world peace with that photo. Oh My God!!! She wasn't even Butterbean then, she was Butterpea! Hand over the Beanie Baby, and nobody gets hurt. Pictures like this wish I'd had more kitten experience. Of the four I've had, only one was a kitten when I got it. The other were Certified Pre-Owned Cats. Oh she is too cute! I can't believe she was able to sleep in a hat! Oh My Gawwd. This just made my week! Charlene Butterbean!! Look at how small you were!! Didn't even see that one coming. I just got KO'd by The Beanie Baby. Oh my goodness! Just look at her! What a treat! I have no words. The cute fuzzy sweetness has rendered me speechless. MY HEART JUST BURST FROM A CUTE OVERLOAD. oh gawd she's just TOO CUTE! i wish i had photos of my kitty! Wow. She usta be a beautiful baby, but brother-- look at her now! :) Beanie bebbeh, you are gorgeous. Wow, she was adorable! She remembers how she felt as an itty bitty and how much love she received from you and Craig. I have to wonder how Drewey felt about the baby 'Bean? Thanks for sharing this glimpse into the past. she could not have been any cuter as a baby girl...and she's a raving beauty now...love that butterbean! OMG Charlene Butterbean was SOOOO adorable! Well, she still is, of course. I clicked through a couple other pics and BOY Craig is a smokin' hottie. Wow. LOL. Congrats on a gorgeous family, both fur and hooman!! I cannot take this level of cuteness. OMG!! NO! Dear Charlene - adorable then, and beautiful now inside and out! Count me in the Charlene Fan Club! All i can say is ... awwwwww! So very precious! Beanie Bay - *snork* What a little sweetie. I like her scruffy look. And what a beauty she grew into. I love you Charlene Butterbean.. The beaniest baby bean! I <3 Charlene! i keep going down to see this wonderful picture of charlene dreaming sweet kitten dreams. What a doll she was/is. Even at that age she looked like such a sweet-hearted, love bug!